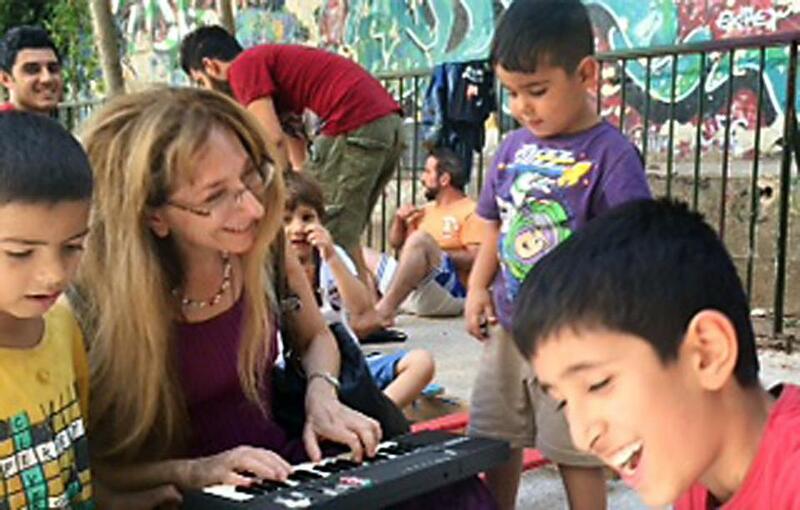 Judy Stillman, a professor of music at Rhode Island College, played a miniature keyboard for children at a refugee camp outside of Athens. Sometimes, when she’s sitting in her home in Providence, or just before she takes the stage to perform, Judy Stillman remembers what it felt like, all those years ago in Israel. She is a pianist, a conductor, a composer, a professor at Rhode Island College and she was playing a series of concerts in Israel in 1991 when Scud missiles started falling to the ground like thunderous rain. She had her 3-year-old daughter with her, and had learned how to put on her own gas mask before strapping one on her child. When the air raid sirens wailed, she reacted instinctively. Amid all that fear, that stomach-churning sense of helplessness and sheer terror, a little bit of empathy grew in Judy Stillman’s heart all those years ago and it’s probably as good an explanation as any for why she found herself in Greece recently. She went to Greece to meet refugees who left everything behind in Syria, Afghanistan, and any other number of countries where civilians are the collateral damage of failed states, cynical terrorists, and soulless war profiteers. She didn’t go as a representative of anything but herself. She also wanted to figure out how to better utilize an arts project called Refugee Artistry, a forum to promote awareness and give refugees a voice through the creative and performing arts. She brought with her a translator, in the form of a 32-key battery-operated keyboard. On the one-year anniversary of the death of Aylan Kurdi, a 3-year-old Syrian boy whose lifeless body, face down on a Turkish beach, captured, if only briefly, the attention of the world, she captured the attention of children in a Greek refugee center. She had learned some Arabic folk tunes and began playing them on her small, beat-up keyboard. When she began playing “Hassissan,” a children’s song about chickens, the kids surrounded her. A young boy knew all the words by heart. The a little Syrian girl, wearing a T-shirt emblazoned with the words “Follow Your Dreams,” approached tentatively and Stillman gave her a rudimentary lesson on the keyboard. Some of the adults looked on, not quite sure what to make of the American lady who showed up unannounced with a small portable piano. One man, a Syrian refugee in his late 20s, stepped forward and asked her to follow him. He brought her to a room in a derelict community center that had been turned into a squatter’s shelter for refugees. There was a bare mattress on the floor and a tent the man and his wife shared. As soon as they entered the room, the man handed Stillman his newborn son. He told Stillman that he and his wife had been at the border in Macedonia, trying to get through, but were held back by armed guards. In the chaos, their 3-year-old daughter got through with an uncle. As the man and his wife stood there blocked, they watched their daughter get swept away in a sea of humanity. They think she is in Sweden. They don’t know when they’ll see her again. At a plaza there was a squatters’ camp, and Stillman met a family that was beaming. They were on their way to the airport. The family’s matriarch had received a visa to go to Germany. Her husband, two sons and two daughters, would stay behind in Greece, but it was a victory. At least one got out. Stillman began playing music again. She played Syrian pop tunes, some songs from Lebanon. Young men clapped and danced. A man pulled a clean napkin from his pocket, unfolded it and put it on the ground, inviting her to sit on it. She went to an abandoned airport where refugees were staying. A family from Afghanistan invited her to join them. One of the daughters, Zahara, spoke fluent English. She said they were from Kabul, that they fled after the Taliban beheaded some of their relatives. Stillman declined an offer of a banana, worrying that the family didn’t have enough food for themselves. Then they tried to hand her a bag of rice and other food. There has never been a greater number of people who have fled their homes because of war and violence than right now. According to the United Nations, 24 people abandon their homes every single minute of every single day. The numbers are staggering. But here, in the richest, most powerful nation on earth, all that seems like a movie, a chimera, or nothing at all. It’s always been hard for refugees to get into the United States. It’s about to get a lot harder, with a new administration less willing to risk the chance that someone allowed into the country might turn against it. Armed with nothing more than a miniature keyboard, Judy Stillman managed to see not potential terrorists but people who would give anything to go back to normal, to go back to work, to contribute, to get their kids back in school. Here, in a country built by political, religious, and economic refugees, her empathy is sadly but uniformly rare.